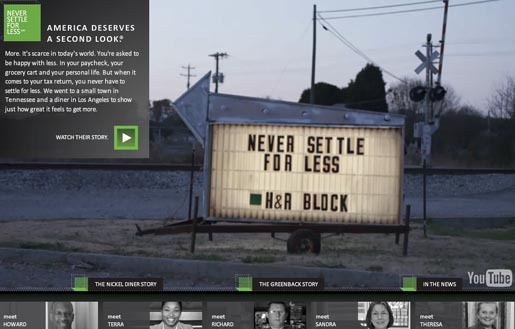 H&R Block, the tax consultants, ran “Never Settle for Less”, an advertising campaign promoting their offer of a second opinion, focused on the small town of Greenback, Tennessee, and a group of customers in Los Angeles. H&R Block representatives gathered small business owners, the mayor, retirees, and anyone else who cared to join in Greenback’s high school gymnasium. When the live country music settled down and each deduction was carefully charted and explained, the surprised workers took turns revealing their jaw-dropping tax returns on stage: $1,426, $2,195, $5,344. By the time the gym emptied out, the town was collectively more than $14,000 richer. On the other side of the country, H&R Block gathered waiters, caretakers, ministers and others in the Nickel Diner, a bustling Los Angeles restaurant for a similar ceremony. The music was jazzier and the crowd urbane and diverse, but the joy was identical to the Greenback celebration as one person after the next was awed by their tax refund. 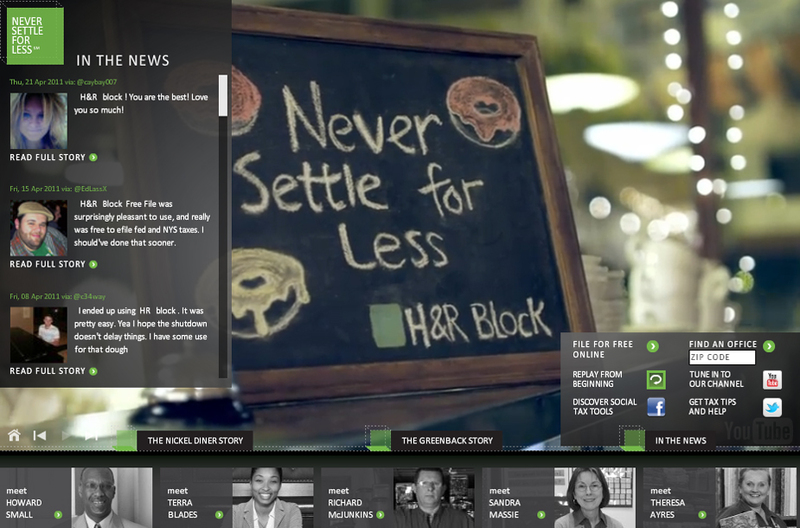 The campaign, launched in January 2011, includes links to the H&R Block Facebook page and YouTube channel. The campaign won a Silver Lion and two Bronze Promo & Activation Lion at Cannes International Festival of Creativity. The Never Settle for Less campaign was developed at Fallon, Minneapolis, by chief creative officer Darren Spiller, digital copywriter David Mackereth, art director Scott O’Leary, digital art directors Noah Carlstrom and Amanda Whitacre, copywriter Ryan Peck, head of integrated production Corey Esse, senior producer Ted Knutson, integrated producer Lauren May, Nicole Earley and Matt Lund, digital producer Nicki Earley, director of business affairs Brendan Lawrence and business manager Brent Larson, account team Chris Lawrence, Pete Leacock and Evan Brown, developer Kla Haeck, and UX Allison Beattie. Filming was shot by director Mark Romanek via Anonymous Content with director of photography Salvatore Totino, executive producer/head of commercials Dave Morrison, head of production Sue Ellen Clair, production supervisor Justine Madero, producer Aris McGarry. Editors were Robert Duffy (Nickel Diner) and Michael Heldman (Greenback, Quilt Lady) at Spot Welders, with assistant editor Patrick Murphree, executive producer David Glean, senior producer Carolina Wallace, and Erik Carlson (Quilt Lady and Gumball Man) at VOLT Studios, with executive producer Charlie Lach. Colorist was Mark Gethin at The Moving Picture Company. Post production and effects were produced at Public VFX by lead VFX/Flame artist James Allen and executive producer Kim Nagel. Sound was designed at Eleven Sound by Jeff Payne.